We always talk about how important it is to regularly vacuum and deep-clean your carpets with Certified asthma & allergy friendly®® products and services to maximize allergen reduction in your home. Carpets are a common home to dirt, dust mites, pollen, and sometimes even mold. But did you know carpet may not be the only culprit hiding these allergens? Tile and grout, which is a porous material, can collect the same allergens as carpet. Not to mention grime and spills, which often discolor the surface of your tile and grout. Regular mopping and spot cleaning don’t always reach the deep pores of your grout lines. However, there’s a new Certified service in town and that’s Stanley Steemer’s Tile & Grout Cleaning Service! Only Certified asthma & allergy friendly®™ products and services—like Stanley Steemer’s Tile & Grout Cleaning Service—are scientifically proven to be more suitable for those with asthma and allergies. So when you see the Certification Mark alongside the Stanley Steemer name, you know their Tile & Grout Cleaning Service passed rigorous testing. Assessing components emitted during the cleaning. Stanley Steemer is the first tile and grout cleaning service to be Certified. 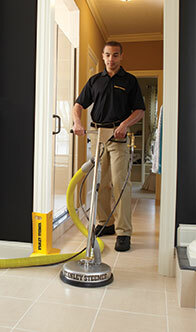 Their cleaning service is proven to remove an average of 96.5% of common household allergens from tile and grout. To find more information about Stanley Steemer’s Tile & Grout Cleaning Service and where to schedule a cleaning, click here.